Oh my Y'all! July has just flown by and I realized I never shared my June purchases with y'all. If you've been keeping up with me than you know that I love the brand Draper James but until recently I've been unable to get clothing items in my size. 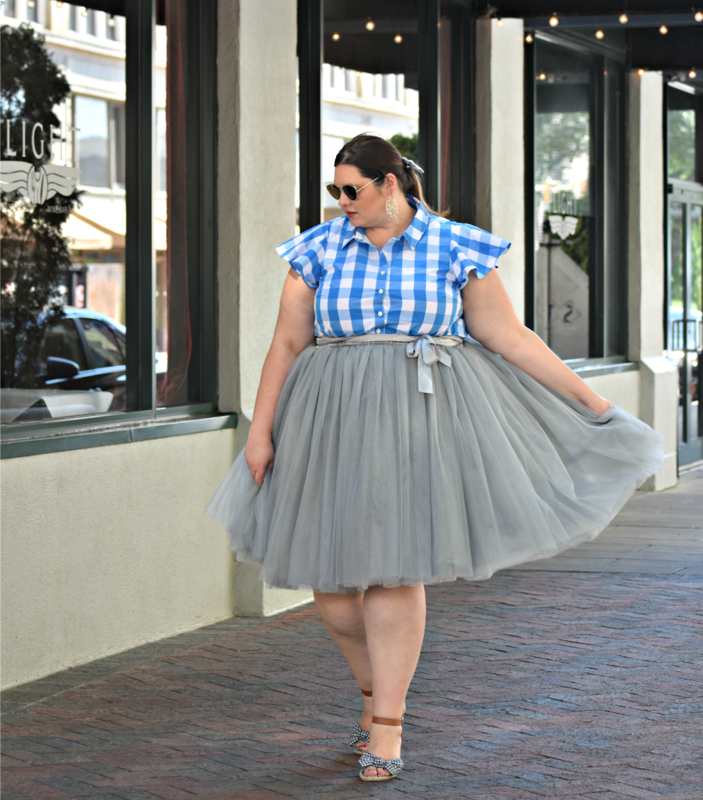 In March Eloquii announces a collaboration with Draper James offering beautiful styles in size 10 to 28 with two different collection releases. From the first collection I purchased a beautiful pink dress but for the second collection I was a little more prepared to purchase a few more items. The first item I really wanted was this blue magnolia dress. I love magnolias and it's Draper James's signature so I knew I wanted something with it. I'm a little disappointed the magnolia print is not the same as the regular Draper James collection but it's still a beautiful dress. 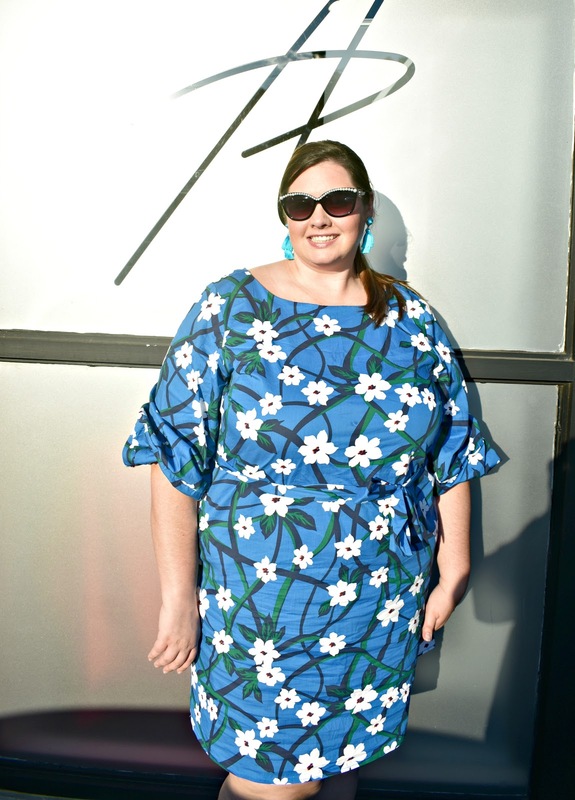 This dress was recently worn by Chrissy Metz so I expect it to be in demand - it's current on sale on the Draper James site, which is what I linked but only in certain sizes. Keeping with the blue (which is Draper James signature color) I also selected this flutter sleeve gingham top. This print is the same as the photo spot outside the Nashville store. have seen this exact print in the Draper James main collection without the buttons and I have also seen several flutter sleeve button down tops. I also selected two tees - the first is navy and says "Darlin" - this is very similar to the Draper James main collection but that tee says "Hello Darlin'" and the script has a little more curl to it. I made the mistake of wearing mine while doing some sample painting so I do have a new one on the way but here it is on the model. 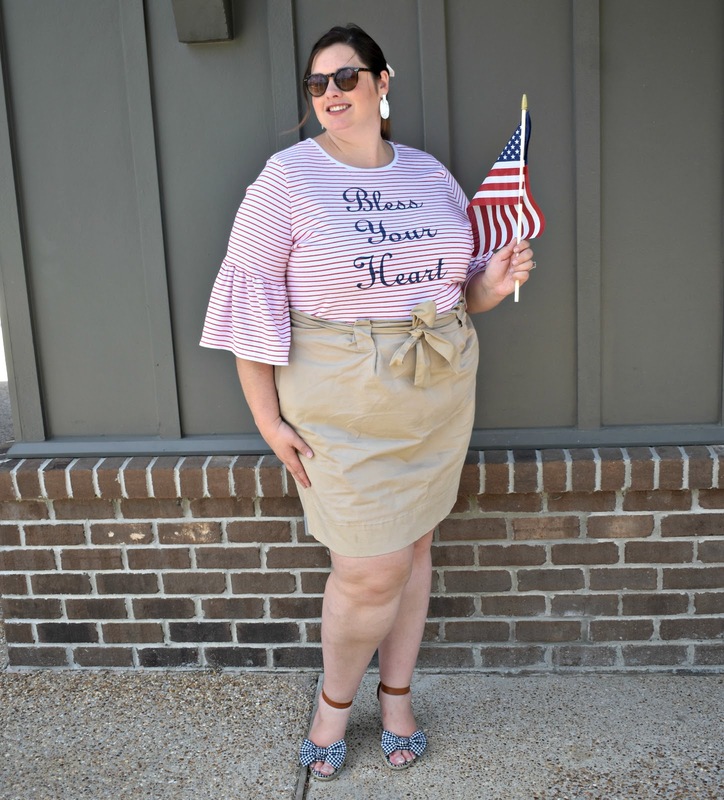 The second tee I purchased says "Bless Your Heart" which is a very commonly used southern phrase and is striped with exaggerated bell sleeves. Draper James main collection tees do not have such an exaggeration on the bell sleeve but they do offer stripped bell sleeve tees with not writing. I feel like I've seen "Bless your Heart" on Draper James main collection items before but I cannot find any pictures to verify this. Each item in this collab is very similar to items in the Draper James main collection and I think the Eloquii team did a great job of staying true to the brand while bringing in some of their own style in a subtle manner - this biggest different of which is in the printed pieces. This gives me much optimism for the Jason Wu collaboration which has been announced to be the next designer collab. My four selections were at full retail price at the time of my purchase but I did have a discount code to purchase for 30% off making my final purchase price $224 which is more than you would spend if you purchased these items right now. Rumor has it there will be a 3rd collaboration drop next Monday. The Eloquii details are a little more trendy than I would prefer but I think the great thing about these items is they have a very timeless style so if you buy on sale you don't have to worry about looking "so last season". When statement sleeves do fall out of style I plan on having the dress and bless your heart tee altered if I am still wearing these item. I can't wait to see if another collection happens and if so what it will look like!